For active Android smartphone users it is absolutely essential to have their operating system running as efficiently as possible. 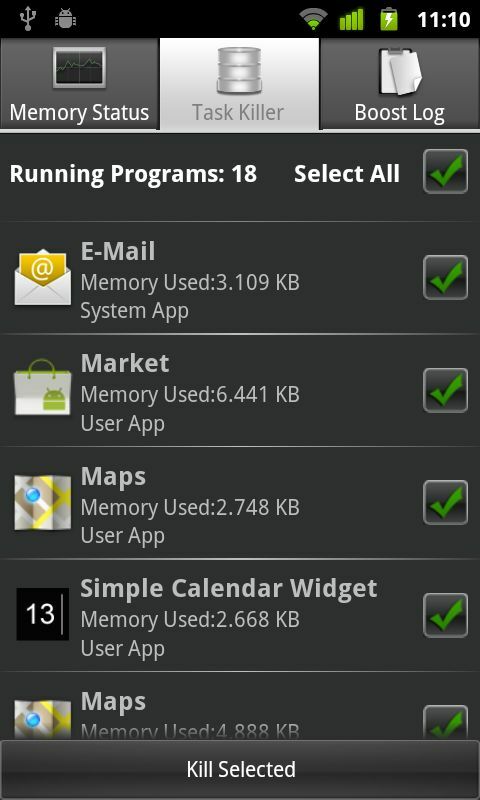 Memory Booster (Full Version) is an app designed to help you optimize and improve your phone's memory usage. But can the app really improve your performance or is it just another battery-sucking parasite from the depths of the Android underworld? At just 0.43MB, Memory Booster (Full Version) doesn't exactly come with a lot of baggage for your internal memory. The app will need access to all of your most secret system tools, which is normal since it runs in the background and needs to constantly keep tabs on the current processes running on your phone. 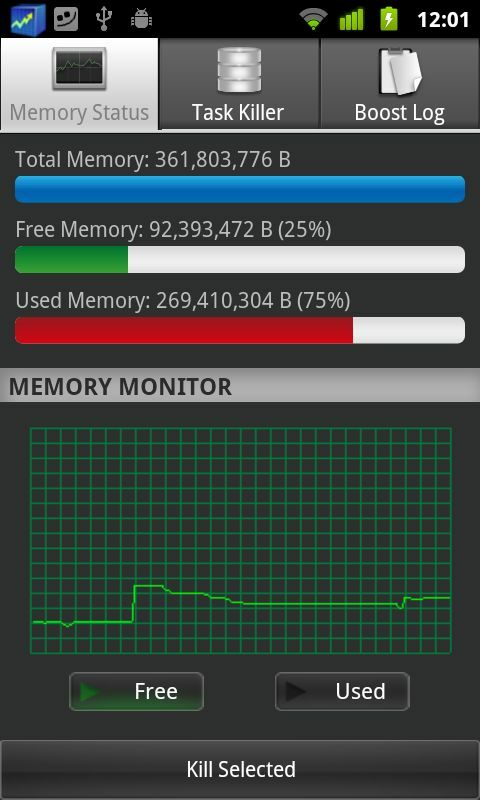 Memory Status: In addition to seeing your current RAM stats, you can view how much of your virtual memory is being used on a real-time monitor. There is also a Quick Boost button which allows you to initiate an automated optimization with just one click. Task Killer: As the name implies, this options stops all running apps and tasks. Boost Log: Just a simple and straightforward log of all your actions and settings. All the three main functions give you a good overview of what the app can do, but the settings are the app's meat and potatoes. Under System Info you'll find detailed information about the hardware, operating system and current state of the Java virtual machine. Next to the System Info button, there is a Setting option where you'll find all of the general preferences including the Boost Manager and Auto Boost options. There you can set up the app to start up automatically every time the phone turns on or at specific intervals. You can adjust the auto boost schedule and set a threshold (between 0 – 35%) after which the boost should automatically kick in. Applications can also be added to the Whitelist Managers Programme, which will spare them from getting killed in the process of an automatic memory boost. In the Boost Manager, you can select between three different boost levels: General Boost, Optimum Boost and Ultimate Boost. The number of apps that get deleted depends on the intensity of the boost program you select. So what's the biggest advantage of Memory Booster (Full Version)? The fact that it can run automatically in the background without ever needing you to participate in the process is the best part. Most app and task managers require you to constantly monitor what is eating up your memory at what time. Here you can sit back, relax and use your phone without having to worry about your internal memory. With boost and constant memory optimization, the app makes sure that your phone is in healthy condition without any unexpected crashes and lags. Thanks to the full automatization of the app, Memory Boost is a great option for beginners looking to improve their phone's performance. In the Settings, you can adjust the program to run according to your personal needs. Most importantly, the program actually works unlike a lot of the so-called memory booster apps out there. Ever since I've switched to using the app, the performance of my phone has improved significantly. Having started out at 89% of my memory being used, my phone currently uses up a maximum of 75% - a pretty significant drop. Personally, I would have enjoyed a small built-in graphic that could show the user just how much battery power is being saved as a result of the app's optimization efforts. Navigating around Memory Booster (Full Version) is a piece of cake with a simple and well-structured layout. In my opinion, the app gets it all right in terms of design by remaining modest and straight-forward. Ever since Memory Booster (Full Version) was installed on my phone, I've absolutely no problems or crashes. That's a dramatic improvement! Memory Booster (Full Version) goes for €2.64 on the market, but as our App of the Week the app give your phone a much-need boost for just €1.32. OK, maybe I was too dramatical. Thanks for clarification. Sorry, actually the worst that can happen is continuous reboots if the task manager is set to aggressive and causes the home launcher to be continuously forced close. Fabien, you're right about Android. But please elaborate what you mean or understand by "harm your operating system". ?? As far as I know, you cannot do that unless you're rooted. Lots if people like to use the above quoted phrase, but none elaborate. Android has a pretty good task management system anyway. No need to install or use task killer. I would even recommend to not do it anyway. You can harm your operating system. Unused memory is wasted memory. E.g You open up the browser and go to a website. 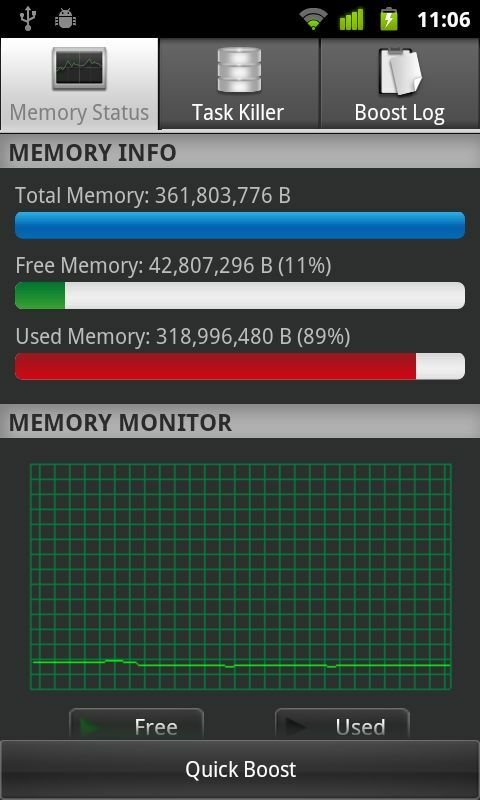 Memory usage is at 85% as an example. You then press the home button and make yourself a cup of coffee. The memory booster kicks in and "reclaims" the memory. Memory usage is now 75%. Sounds terrific right? WRONG! When you reopen the browser, it has to reload the page again. Hence battery life is shorter on the phone. On low end phones with low memory, task killers may speed up the phone. I know because I have one! However, battery life is affected and you cannot truly multi task. Is this app just an automatic task killer, or does it free up storage like caches and stuff too?